I’m thankful it’s a short week this week after another super busy day at work. Still being sore from Sunday’s mud race didn’t help, I felt like a zombie limping out of bed this morning. I guess it’s true, day 2 is always the worst for sore muscles. My aches and pains today made me crave something high in protein, so I made it a tempeh night opting to try something new with it. 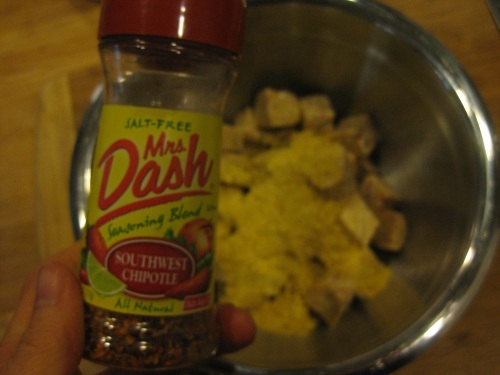 I went with something I found in the back of the spice cabinet that has been there for … I have no idea! But it still tasted good. And bake at 350 degrees for 25 minutes. 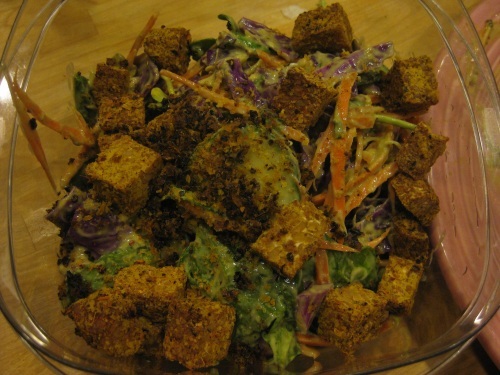 I paired it with a monster salad coated in Gena’s Creamy Avocado Cumin Dressing. And they were good, like better tasting crunchy tater tots. And probably something that kids would enjoy as a tater tot alternative. As for Gena’s dressing? Yum! A surprisingly strong and tart flavor that I thoroughly enjoyed. It wasn’t the easiest to make having to toast cumin seeds, but worth it. When my husband saw the baking cubes in the oven, he asked if I was making homemade croutons. Which gave me inspiration on how to pack the leftovers for lunch tomorrow. 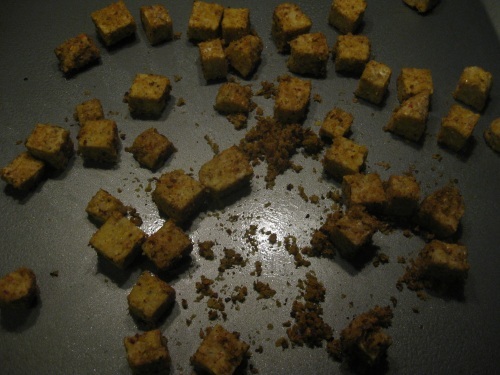 Love the looks of the “croutons” or crunchy tater tots…I totally need to make this for Skylar. 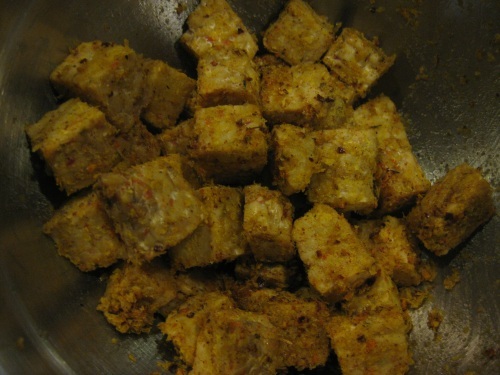 Sometimes tofu isnt crunchy enough but i bet tempeh would be….it’s on my to do list now! Clever! Never thought to bake tempeh! Ooooh YUM! This works wonderful, and tempeh is basically the only soy product I let myself have. I’ll have to pick some up asap! I wonder if I could get Arc to eat this if I swore they were tater tots ;) I’m all over putting them in a salad, too. What a great post to find your blog with! Great post. 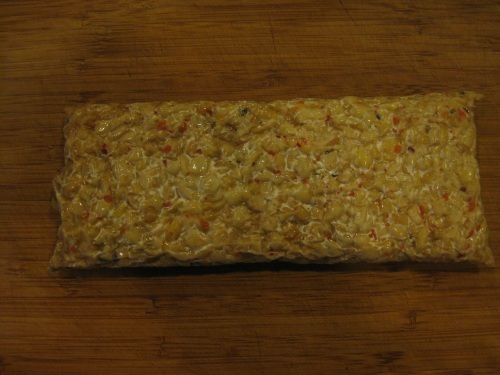 I’m constantly looking for ways to prepare tempeh, since I prefer it over tofu. 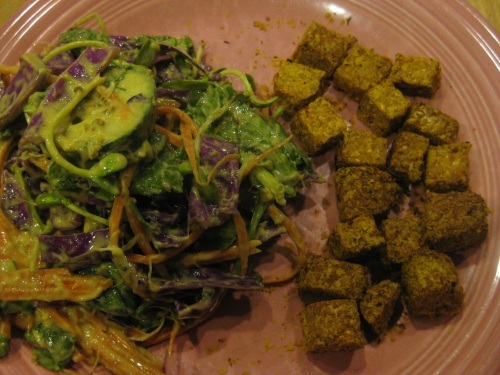 Sometimes I just eat it raw with no added flavor, but your recipe looks way more appetizing :) Love the blog!